The major development of inks in recent years has been the increasing use of pigments and acrylic resins. The difference between the dye-based inks and the pigmented inks are a slight reduction in colour intensity, but much improved resistance to fading. 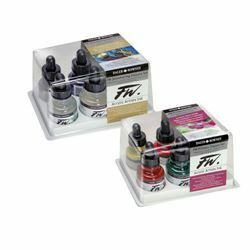 FW Artists’ Ink is an acrylic-based, pigmented, water-resistant ink (on most surfaces) in a range of 38 colours, all of which have either a 3 or 4 star rating for permanence. Such a high degree of lightfastness over such a range of fully intermixable colours makes them ideal for use by artists in the production of pictures for permanent display. Equally, however, colours can be substantially diluted to achieve the most subtle of tones, very similar in character to watercolour. Such washes will dry to a water-resistant film on virtually all surfaces and successive layers of colour can be laid over. 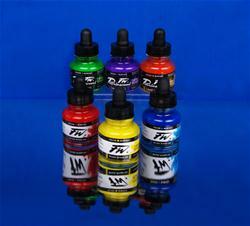 FW Artists’ Inks work well through airbrushes and technical pens.